A modern astronomical spectrum is basically a graph that plots intensity of radiation, for example visible light, against wavelength or frequency. 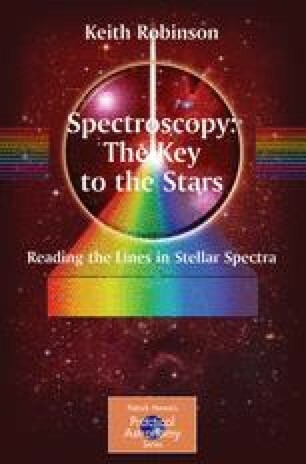 The fascinating character of astronomical spectra is the result of light and other forms of electromagnetic radiation interacting with matter—i.e. atoms and molecules. In this chapter, we’ll review some basic things about light and electromagnetic radiation.We’ll take a look at the purest spectrum; the so-called ‘black-body’ spectrum and how nineteenth-century physics failed to explain it. The consequences of its solution, a ‘quick fix’ at the time turned out to be profound to say the least and resulted in the whole science of spectroscopy as we know it today. Then we’ll look at the structure of atoms and see how there were problems here too, which could only be solved by introducing what at the time were some pretty weird ideas.